Thompson-Ames Historical Society has planne d a special event for 1:00 p.m., Tuesday, July 18th at Gilford’s Rowe House, at 88 Belknap Mountain Road. The after-noon event will feature Virginia Gerseny’s “Meet Jane Pierce” Tea, an opportunity to spot light the wife of Franklin Pierce, the 14th President of the Unites States, 1853-1857 -- and the only U.S. president who hailed from New Hampshire! This presentation is underwritten by the Samuel P. Pardoe Foundation, which helps fund educational programs. Virginia Gerseny, a graduate of Ohio Wesleyan University as a music major, did her graduate work in drama at Western Reserve University and then taught drama at Texas Christian University. 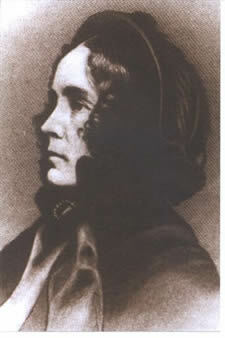 A multi-talented person, Virginia Gerseny, along with her husband, later owned a large costume company, a resource that she drew upon during her years in Ohio when she presented platform portraits of interesting women, including Empress Josephine, Queen Isabella, and Harriett Beecher Stowe. Two years ago Mrs. Gerseny moved to Concord, New Hampshire, to be near her grown sons who now live in New England. As might be expected, Virginia Gerseny’s interest was piqued by Concord, NH’s historic setting and, in particular, the Pierce Manse, home of President Franklin Pierce. When she inquired about Mrs. Franklin Pierce, to her surprise there was little to learn; Jane Pierce was almost unknown! So the research began, a picture of the costume was found and copied, and Jane Pierce’s story was prepared. This is the story that will unfold as Virginia Gerseny portrays New Hampshire’s First Lady Jane Pierce at a Tea at the Rowe House on Tuesday afternoon, July 18th. Refreshments for the Tea are being prepared by Brenda Trudeau, Diane Mitton, Doreen Knight, Carol Anderson, and Karin Landry. After the tea, there will be tours of the Rowe House (Gilford’s c. 1838 Greek Revival Cape farmhouse constructed of bricks made on site) and of the 1834 Union Meetinghouse, where a Franklin Pierce sword is on display. Space is limited so if you wish to attend, please call Thompson-Ames Historical Society at 527-9009 and leave your name, telephone number and a brief message. A $5 donation is requested of those who are not members of Thompson-Ames Historical Society; a $2 donation is requested on T-AHS members. For further information about Thompson-Ames Historical Society and its activities, please view the Society’s website www.gilfordhistoricalsociety.org.